Devin has been nagging me to put some pictures up of the virgin run and pictures of the first wakeboard and surf runs of the season. I somehow didn't get any pictures of Devin surfing behind the boat... sorry babe! 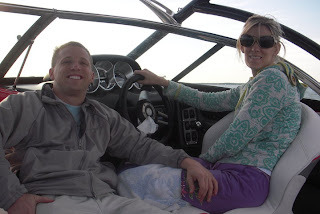 but we had a great time although it was raining a little Saturday that didn't stop us from going out on the boat! It really only rained on us for about 20 mins. we were lucky! Here are some shots of the guys. Congrats on the new boat! I keep telling Scott he might come home to one parked in the driveway someday!!! Some of my fondest memories growing up were spent on our families boat. So fun! Hopefully we'll get to check it out sometime.